One of England’s most celebrated (and wordy) authors would be celebrating his 200th’s birthday today. The Guardian is celebrating this occasion with a really cool interactive Wallchart of Dickens and some of his most famous characters. 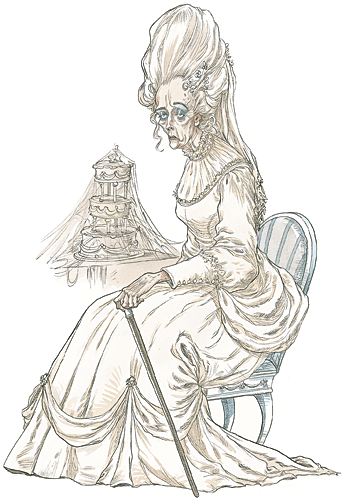 Miss Havisham is my standout favorite. Who is yours? She had a long white veil dependent from her hair, and she had bridal flowers in her hair, but her hair was white. Some bright jewels sparkled on her neck and on her hands, and some other jewels lay sparkling on the table. Dresses, less splendid than the dress she wore, and half-packed trunks, were scattered about. Here on the books desk the season of reading never ends, but we’ll be running our Books Season for six weeks. Inspired by the folks atBookcrossing, ReadItSwapIt and Book Swaps for London, we’re planting 15,000 books around the country between now and mid-October as part of a nationwide Book Swap. The first drop happened on Saturday, and as the weekend went on news spread around the world, with tweeters from as far apart as Nigeria, Canada and Hanoi wondering how to get involved. The Bookswap mentioned in the quote above is referring to a nation-wide book drop off program that took began last weekend on Saturday. The Guardian acquired 15,000 books from various publishers and authors and will be leaving the books all over the place in parks, restaurants, subway stations, for anyone to pick up and peruse. Also, check out the Guardian’s Book Power 100 list to see who’s-who’s in the influential world of literacy, publishing, and bookselling. JK Rowling is the #2 most influential person in the book industry, who is number one? The answer might not really surprise you…but it should.